Das elektronische Abfallnachweisverfahren eANV ist bereits ein Jahr im Betrieb und hat mittlerweile das altePapierverfahren zur Dokumentation und Überwachung von Sonderabfallströmen erfolgreich abgelöst. Über 46.000 Betriebsstätten sind bei der elektronischen Datendrehscheibe der Länder, der Zentralen Koordinierungsstelle ZKS-Abfall registriert und führen ihre Nachweisdokumente auf elektronischem Wege. Für die Rechtsverbindlichkeit sorgt die qualifizierte elektronische Signatur. Die Behörden können berichten, dass sie Formulare in Papierform quasi nicht mehr erhalten. In order to comply with the requirements of the German Ordinance on Waste Recovery and Disposal Records Verordnung über die Nachweisführung bei der Entsorgung von Abfällen (NachwV) concerning the supervision of hazardous waste a laborious procedure based on paper documents has been applied both by companies and authorities. Approximately 250,000 companies generate and handle up to 10,000 records of proper waste management (= Entsorgungsnachweis), 3 million consignment notes (= Begleitscheine) and 14 million handover certificates (= Übernahmescheine) each year. Though the procedure has proved itself it is very laborious for all parties involved. 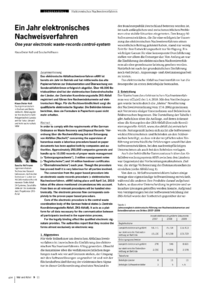 The conversion from the paper based procedure into an electronic waste-records procedure (= elektronisches Nachweisverfahren, eANV) taking place until April 1st, 2010 takes all the above mentioned circumstances into account. From then on all relevant procedures will be handled electronically. The electronic process flow corresponds completely to the proven paper based procedure. Core of the electronic procedure is the central waste coordination body of the German federal states (= Zentrale Koordinierungsstelle Abfall, ZKS-Abfall). It acts as a platform for all data necessary for the communication between all participants involved in the supervision process. For the legally binding effect the qualified electronic signature provides. The authorities report that they receive the forms almost exclusively on electronic way.